Green Apple Environment Award.CSR Award. | Browns Antiques Billiards and Interiors. Brown’s Antiques Billiards and Interiors are winners of an International CSR Excellence Award for the second year running. 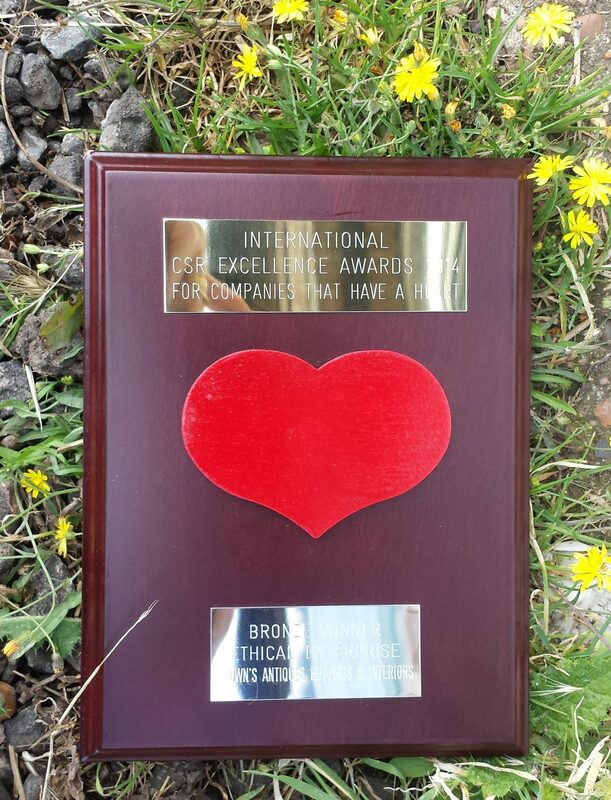 We are delighted to announce that we are winners of an International CSR Excellence Award for Ethical Enterprise 2014. 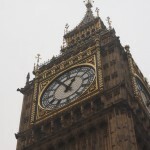 The Corporate Social Responsibility Awards recognise Britain’s most caring companies. Trophies were presented at a ceremony at The Crystal, London in June 2014. More details below. Click here to read about the winners. Ethical Enterprise Award. Brown’s Antiques Billiards and Interiors. ANTIQUE BILLIARDS COMPANY ON THE WAY TO GLORY. 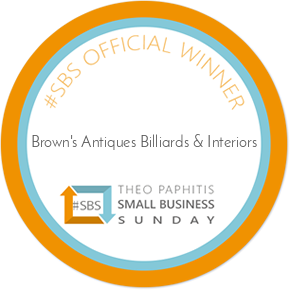 Brown’s Antiques Billiards and Interiors based in Cardington, Bedford has won an International CSR Excellence Award for Ethical enterprise, in the national campaign to find Britain’s most caring companies. They competed against more than 200 other nominations in the International CSR Excellence Awards 2014, and they will be presented with their trophy and certificate at a presentation ceremony in The Crystal, London in June. As a result of this International CSR Excellence Award success, Brown’s have been invited to have their winning paper published in The Global Guide to CSR Excellence, the leading international work of reference on corporate social responsibility best practice, so that others around the world can follow their example and learn from their achievement. Mark Brown, the owner at Brown’s, said ”We are delighted to have won this prestigious award. 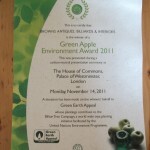 We like to think of ourselves as a ‘Green’ company, having won a Green Apple Environment Award previously. We restore antique furniture and antique snooker tables and billiards tables so that they may be used by future generations. We try to be environmentally friendly in all aspects of our business, including using natural materials and traditional polishing techniques. We do not spray finish or use nasty chemicals. It is fantastic to see our efforts recognised in this way. 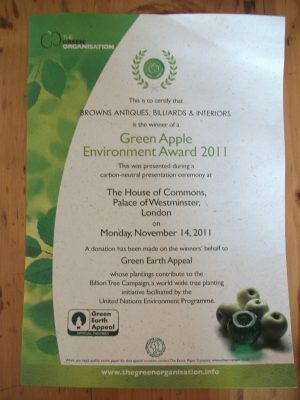 Brown’s Antiques Billiards and Interiors competed against more than 500 other nominations and we were presented with our Green Apple Environment Award at a glittering presentation ceremony in the House of Commons on November 14 2011. As a result of this success, we have been invited to have our winning paper published in The Green Book, the leading international work of reference on environmental best practice, so that others can follow our example, and learn from our experience. 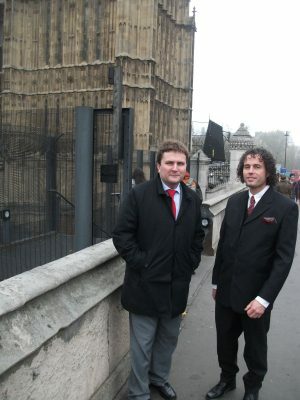 We will also be considered to represent our country in the European Business Awards for the Environment. 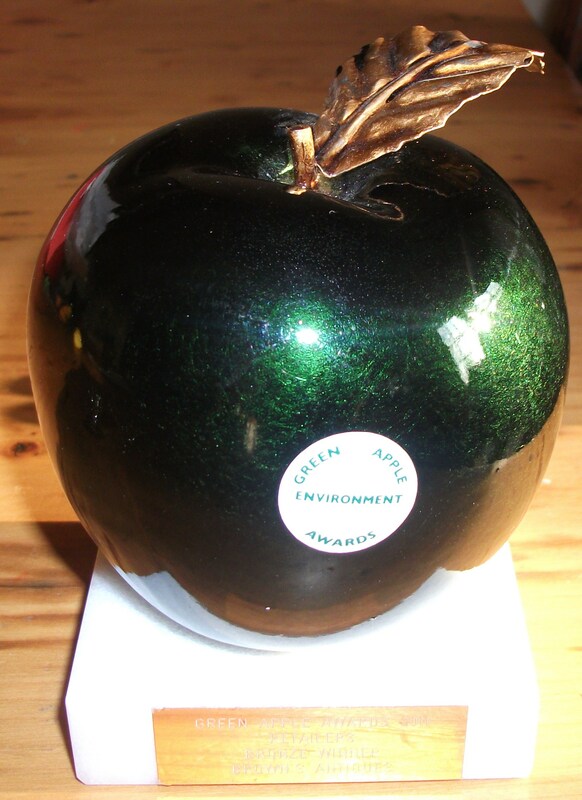 The Green Apple Awards began in 1994, and are organised by The Green Organisation, an independent environment group dedicated to recognising and promoting environmental best practice. 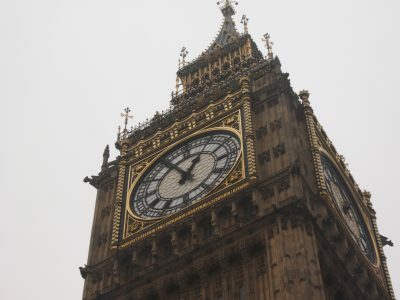 Judges for the Green Apple Awards are drawn from the Environment Agency, the Chartered Institute of Environmental Health, the Chartered Institution for Wastes Management and other independent bodies. 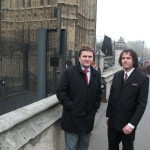 Director, Mark Brown said ”This is an exciting award for our company to win. As a company we are passionate about the environment and ‘being green’. By its very nature, our antique furniture business is environmentally friendly, restoring antique furniture, so people can re-use it rather than buying new. We also ensure we use only natural products and materials wherever possible and we use local suppliers.” Brown’s Antiques, Billiards and Interiors. Green Apple Environment Award Winners. Green Antique Furniture Company. Brown’s Antiques Billiards & Interiors. Green Apple Environment Award Winners.